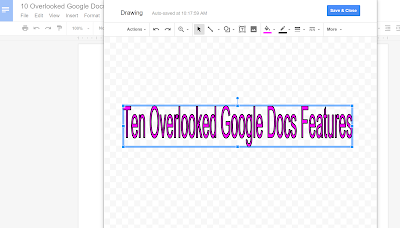 Best of 2018 – Ten Overlooked Google Docs Features – TC Net-Works, Inc. This week is a vacation week for the vast majority of readers of this blog. As I do at this time every year, I’m going to republish some of the most popular posts of 2018. Here’s one from January. Google Docs has a lot of features that new users often don’t notice. Some these are features that even experienced Google Docs users overlook. Some of these features will save you time, some will give you more formatting flexibility, and others will improve the way that you share your documents. Just like in Google Slides, you can insert Word Art into Google Documents. The process of using Word Art requires that you use the “drawing” option found in the “insert” drop-down menu. Word Art is great for inserting colorful headlines into your documents. Once again the “drawing” option found in the “insert” drop-down menu is quite helpful. Use the drawing pad’s free-form line drawing tool to create your signature and insert it into a document. You can do this with a mouse, but if you have a touch-screen computer it is even easier to do. Inserting your signature is a great way to personalize letters that you send home to parents. 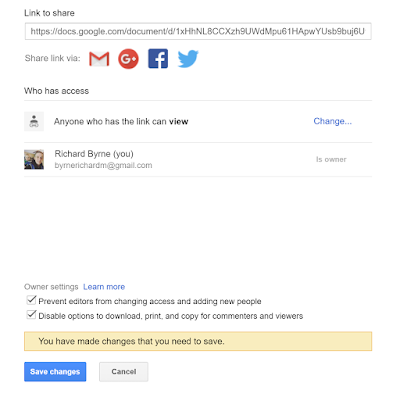 Not everyone with whom you have to share documents is going to jump on the Google Docs bandwagon. For example, I used to write for a publication that only accepted Word files. That didn’t mean that I had to write my articles in Word. I wrote my articles in Google Docs then just downloaded those articles as Word docs before sending them off as attachments. You can also download your Google Documents as PDFs, Rich Text documents, HTML, Plain Text, Open Document, and ePub. One the original selling points of Google Docs was document sharing and collaboration. That feature is still the thing that makes Google Docs special. In fact, just yesterday at the BETT Show I saw someone presenting just that feature. But sometimes you want to share your documents without letting other people make copies of them or print them. So when you open your sharing settings select “advanced” and you can prevent people from copying, downloading, or printing your documents. Restricting printing is a great option to use when you just want someone to look at your document for a final review but you don’t want them to print it. For example, when writing up a IEP you might want a colleague to look at it, but you don’t want him or her to print it because you know that he or she is the one who sends everything to a network printer and then forgets to pick it up for an hour. It used to be that you needed a third-party application in order to use voice input in Google Docs. Now you can just open the “tools” drop-down menu and select “voice typing” to start using voice input into Google Documents. Are your students using Google Keep to bookmark references for inclusion in a research paper? If so, they can access those bookmarks without having to leave Google Docs. They can access those bookmarks and insert them into their documents by opening the Google Keep Notepad from the “tools” drop-down menu. The question that new Google Docs users ask me more than any other is, “can I use landscape mode?” Yes, you can use landscape mode. Open the “file” drop-down menu and select “page setup.” From there you can change the page orientation, the page size, change and set default margins, and you can even change the page’s background color. Need columns in your document? You can insert those from the “format” drop-down menu. However, the columns will apply to the whole page. If you only need columns for part of the page, use the “table” drop-down menu to insert a simple 1×2 table. The table’s cells will expand as you type. In the early years of Google Docs headers, footers, and page numbers had to be manually inserted. Today, you can have headers, footers, and page numbers automatically inserted into your document by making those selections from the “insert” menu. You can even apply them retroactively.